There are already sites and auctions up with fake Yeezy Boost 350’s trying to capitalize off the launch. People are already getting taken for a ride. Unlike the 750, differentiating between authentic and fake (aka unauthorized or replica) 350 is quite easy. *UPDATE* It seems a new version has started production and looks more similar to the Authentics. Altho the upper pattern has been fixed, the heel tab dots are still off. 1 – Never pay via Paypal Gift. Always use a credit card or invoiced transaction. 2 – Demand tagged pictures with handwritten tags. 3 – Request the box and receipt in the photos. 4 – If a seller or site offers 1/2 sizes, they are selling fakes. End of story. Lastly compare those photos with the chart below to determine authenticity. There are no “alternative” or “variant” pairs. They should ALL look like the real example below. 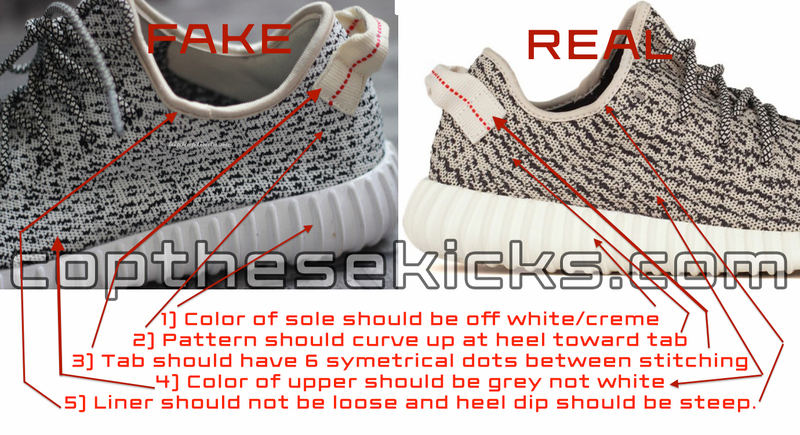 Fake Adidas Yeezy Boost 350 tend to have a white sole and white upper. Compare the heel tab and liner stitching. If they seem to be lighter than the upper, than it is most likely authentic. If the Tab and liner are darker than the upper, it is likely fake. The sole is also a dead giveaway with the fakes having a bright white sole instead of that off white that Yeezys have. 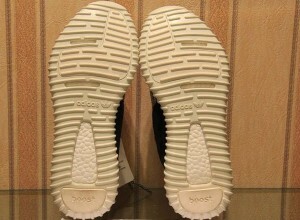 Looking closely, the dots on the heel tab are more square and unevenly spaced on the fakes compared to the real Yeezys. In the square stitching there should be six red dots, no more no less. It’s subtle for sure but good to request a detailed photo to be safe. The upper differs in more than just color. The pattern should be linear and arc up toward the heel tab. If the lines seem very broken up and in a straight line they are fakes. Finally, and this is harder to tell in photos, the fake primeknit is loose and almost sloppy. The ankle cut is shallow and wavers. Real Yeezy Boost 350’s have a sharp angle and are tight and hold shape. China has been pumping out new revisions that make Fake Turtle Dove Yeezy 350’s even harder to spot. While they fixed a few things, they’d failed to cover a few bases still. Mirrored Patterns of the boost visible on the sole is a dead giveaway. Patterns should not be identical mirror images from left to right. Nearly every pair of fake Yeezy Boost 350’s have mirrored patterns on the sole. Given the current state of the Yeezy replicas, we stand by our Talk Kicks opinion. You’re probably best staying away and waiting on the next release. I made an order from a guy living in Cape Town,South Africa for Kanye x adidas Yeezy 350 Boost’s. He tells me they’re authentic and I read an article saying that only 9000 pairs of original YZYs were made and were sold out in 10min. I don’t know what to believe?